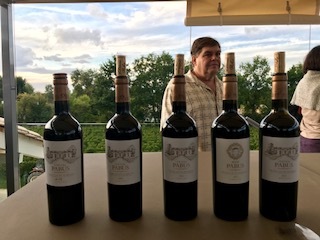 During a recent media tour set up by Planet Bordeaux, our group headed to Château Pabus in Sadirac for our first on-site tasting of the trip. The 19th century chateau and vineyard were purchased by New York financier Robert S. Dow at the suggestion of his daughter due to his love of Bordeaux wines. After extensive searching throughout the region, the property was chosen for both its history and its future potential. 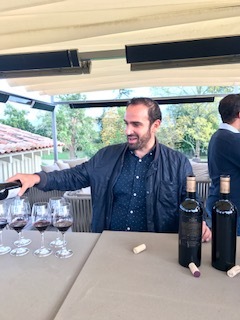 In 2012, Dow asked Belgian winemaker Kris Couvent who was the property's former owner to help manage the estate with the help of wine consultants Michel Rolland and Bruno Lacoste. The goal was to bring the 6.47 hectare or sixteen acre vineyard area to peak health using no herbicides while using what they call rational cultivation techniques like encouraging natural grass cover crops. The vineyard soils are a mix of silt, sand and clay and are planted with 85% Merlot some of which is pictured on the right and 15% Malbec. They are planted at a density of 5,500 vines per hectare, all of which is harvested by hand. A new winemaking facility was also built along with a vat house addition and an outdoor tasting terrace to take in the vineyard views. The new construction reflects the modern vision for the Château's future. We gathered up there after our tour of the property for a vertical tasting of the chateau's wine. Château Pabus 2012 - Lush, juicy, rich and balanced, very drinkable. Petit Pabus 2013 - Soft, charming, red fruit character with a hint of freshly tilled earth. Château Pabus 2014 - Leaner, more linear structure with chewy tannins and a spicy finish. Planet Bordeaux ambassador, Michael Madrigale made the comment that there was "a pureness to the fruit" in this glass. Château Pabus 2015 - Big tannic structure, more muted aromas and flavors, not quite ready to drink yet. Château Pabus 2016 barrel sample - Oak nuances and fruit are not yet integrated. This wine will go another six months in barrel before it is ready to be bottled. 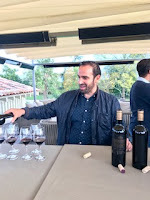 The team's commitment to quality at Château Pabus is apparent on the property and in the glass, enjoy the top three now and lay down the 2015 for a treat at a later date, all are recommended wines.